I’m moving very soon, which means I’m sorting through paperwork, tidying up my computer files, and packing up the last boxes. Found a digital folder called ‘undergraduate art ugh’ that has paintings I did (often poorly) in the early to mid 90s. It’s interesting to see that my style has greatly evolved, but it’s already present in this earlier work. 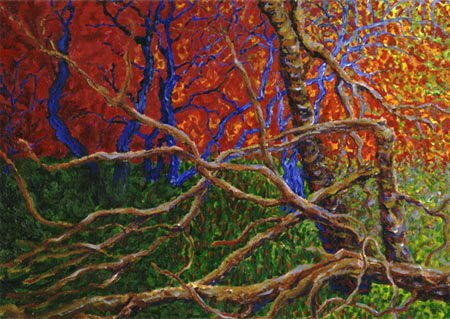 Bright colors, twisted trees, Impressionist influence. I think this one is from 1993. This is probably from 1994. And this may be from 1996.